I saw the live performance of this (twice!) and I was not sure what my reaction to the DVD would be. It’s a different experience seeing it from close up – and hearing the commentary. Elizabeth’s odd rolling gait was the director’s idea (the singer, Elza van den Heever, had initially gone for ‘royal’ but McVicar had other ideas), and according to Deborah Voigt, who does the interviews/introductions, the second act is supposed to take place ten years after the first. This was news to me. I don’t think there’s a ten year gap at any point during Schiller’s play – at least, I don’t remember one – and I had no idea there was supposed to be one in the opera. I don’t think it’s necessary; the drama, such as it is, works without it, and as far as structures for stories are concerned I’d rather have one seamless arc than two chunks with a hole in the middle. (Mary was involved in a series of plots in the 1580s before her execution in 1587 – maybe the idea is that those happened in the interim, making her innocence less obvious and changing the game a little post-confrontation scene? Maybe if I paid more attention to the libretto this would be obvious. Then again, Mary had been accused of all kinds of sketchy things even before the late 1570s (i.e. the end minus ten years) so I’m not sure that works either. This is probably one of those questions that is not worth pursuing.) But it does make some visual details of the second half easier to explain – the fact that Leicester’s hair and Cecil’s beard are grayer. There was one thing that I suspected I would find slightly irritating close up on DVD: Mary’s constant trembling in the second half. I was right, although it wasn’t as distracting as I thought it might be. And besides, when DiDonato sings the way she does here, she can basically do whatever else she and the director want as far as visuals and I do not mind at all. I was complaining that I had nothing new to listen to the other day. 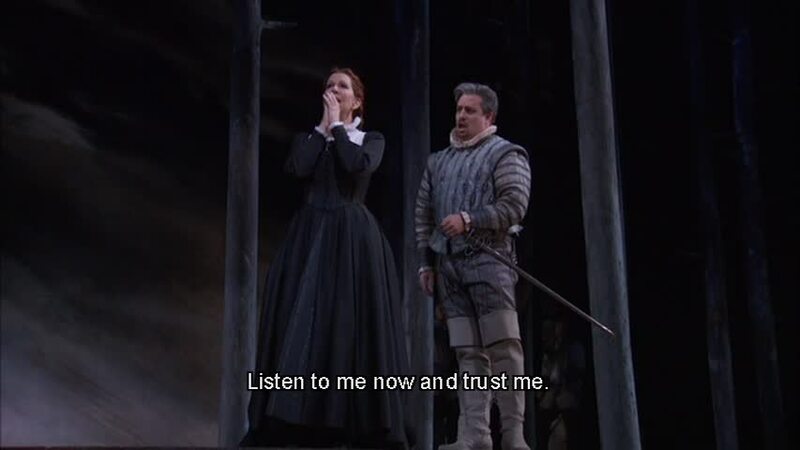 My other half suggested that I watch my DiDonato Maria Stuarda DVD again. After all, I do sometimes go and see two different performances of the same concert or opera if it’s possible and I have a good reason to do so. Me: It’s a DVD. It’s not a concert. There aren’t any fluctuations. J: But there are like different cars going by outside, right? And there even could be a car alarm. Or those people down the hall with the two children could try to get their big stroller into the elevator again! * That could totally reshape the whole concept if they do that during the confrontation scene! *Those people should know by now that that stroller doesn’t fit in the elevator. Mary Stuart: cross-linguistic funhouse edition! The take home lesson of this DVD is that even though Donizetti’s Maria Stuarda is based on Schiller’s play Mary Stuart, the two works of art do not actually have all that much in common. Indeed, they are quite different. I am not sure that performing them GLEICHZEITIG is strictly necessary to get this point across, but I tell you one thing, it is an experience that one does not soon forget. In fact, my impulse is to state from the start that many a production of the Donizetti opera might well be improved by having the two queens meet in the park, insult one another in Italian and then start screaming at one another . . . in German. It gives it that added “am I high?” kind of ping! that your more conventional productions of bel canto operas often lack. 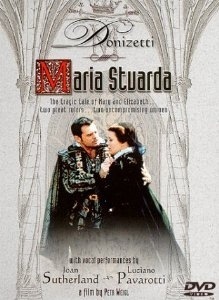 I am not sure whether this is the bottom of the barrel or not, but I have succumbed to desperation and have taken out this specific DVD of Maria Stuarda that the library has. Up until today I had given it only a sort of cursory glance because I wanted to pretend I wasn’t thinking about watching it, and so I thought it was merely a dubbed movie version of the opera. You know the prayer scene in the second half of this opera? Every time I see it, I always end up wondering, who are all these people? If they’re supposed to be Elizabeth’s courtiers and they all think that Mary Stuart is really great, I begin to see William Cecil’s point, if you know what I mean. I just discovered that the Houston opera has put up little clips of their production of Mary Stuart. Very little clips – not even two minutes each! But I am not going to look a gift clip in the mouth. This opera can be a little bit weird if you start thinking about it too hard. For one thing, it’s very much one of those nineteenth-century ‘history with the politics taken out’ operas. (I am going to talk about only the opera here, not Schiller’s play, or else we will be here all morning.) Taking the politics out of history can be a tricky thing. In this instance, what it does is flatten the complicated confessional and dynastic politics of the late sixteenth century into a story about romantic jealousy. Or something. This production is quite simple in visual terms. The stage is mostly black and bare, with a few pieces of scenery standing in for walls or pillars or whatnot that appear and disappear. In Act I Elizabeth has a podium/lectern/pulpit thing with stairs — there is a word for this object, but I cannot for the life of me think of it right now — and later on Mary has a sort of Death Podium, i.e. the same object as Elizabeth’s but made of iron bars. I thought that the Death Podium was going to reappear as a scaffold in Act III but I was wrong. In the last act we have a small platform, and later behind it a large cut-out cross toward which Mary is turned, in anticipation of her execution, as the opera ends. The costumes are historically appropriate, with some nice contrasts of color – Elizabeth in brilliant gold or yellow with the chorus in more subdued blues and grays, and Mary spending the last part of Act III in a blood red shift. The whole thing is simple, direct, and doesn’t get in the way. I have had this stuck in my head on and off for several days. I have no idea why.